Wow! 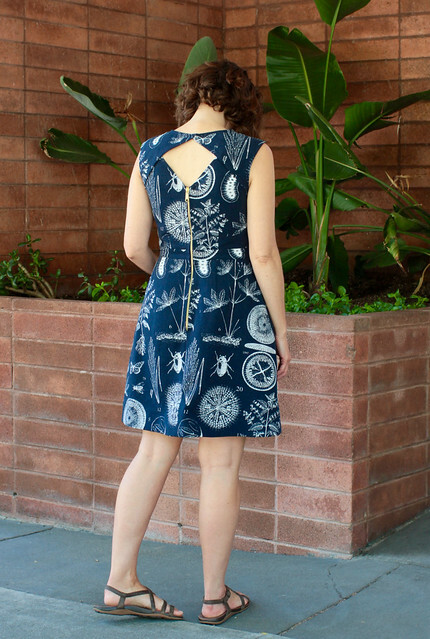 I can’t believe I finally made a Belladone dress. This pattern caught my eye ages ago, and then my Mom bought the pattern for me at Christmas (thanks Mom!). Since I imagined it as a summer dress I waited. And checked out lots of Belladone inspiration. You can find my favorites on my Belladone pinterest board. The fabric is from IKEA. 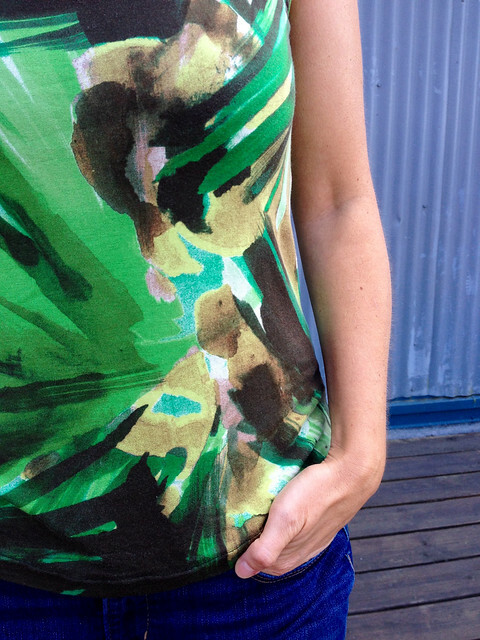 I totally loved the botanical print and it’s a nice medium weight cotton. And less than $5 a yard which is perfect for a wearable muslin. The sewing wasn’t too hard and the instructions were more than sufficient though definitely not hand-holding! I’m glad I waited until I had some experience with dresses to try this. And lots of bias tape practice. This is my first time doing an exposed zip. I hand-picked it which is definitely my preferred way to do a zip. So precise. I like the way it turned out and will probably do this again soon. This was also my first time using a hem facing and it made hemming the dress very easy. I am not usually very excited about hemming (last step, why can’t I wear it yet, who knew the hem was so long…) but this was pretty fast and looks very nice. I graded between sizes using a 36 at the shoulders, 38 at the bust and 40 at the waist and hip. I was hoping to avoid any gaping around the back detail and was mostly successful. 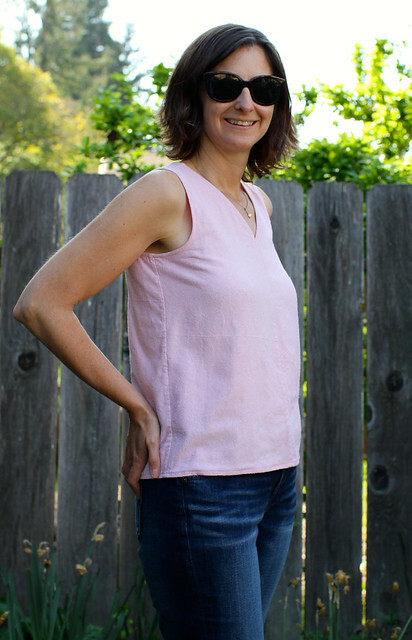 It looks ok in the pictures and is comfortable to wear, but I will fold maybe 1/4″ out of each of the top back pieces and take a tiny amount out of the front neckline. 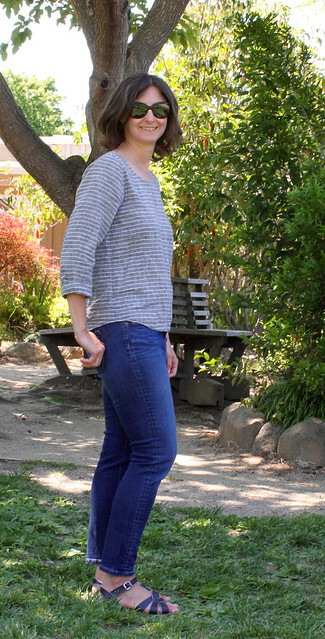 Linking up to Gray All Day’s Sew it Chic in a Week – check it out! 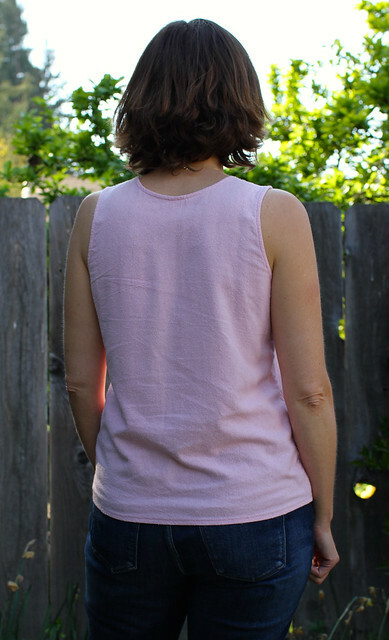 I pulled out the muscle tee pattern and added the scoop neck from the Plantain. Which means I used the Plantain without sleeves, with a slightly raised scoop neck, the waist/hip curve straightened out, and the whole top shortened. I used bands to finish the neck and armscyes. 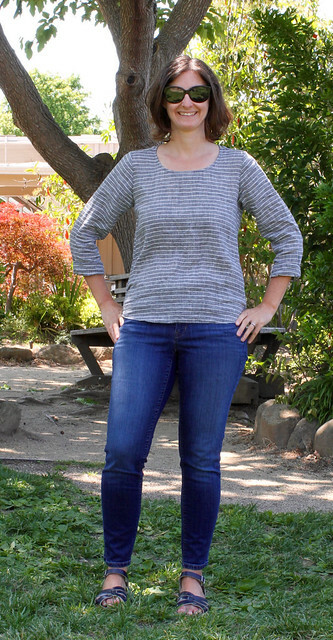 Linking up with Gray All Day for Sew it Chic in a Week. Go check it out. Me-Made-May is off to a good start! 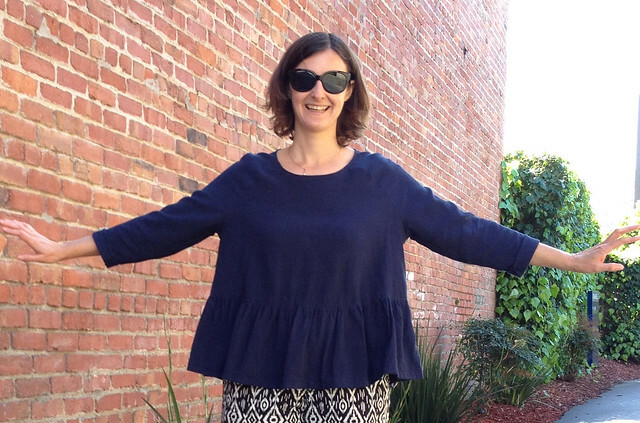 I’ve got a couple of new garments to share today, both from Grainline Studio patterns. 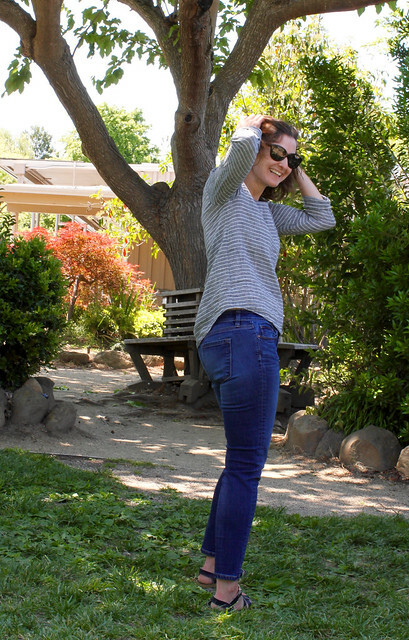 First is this light and airy Scout Tee. 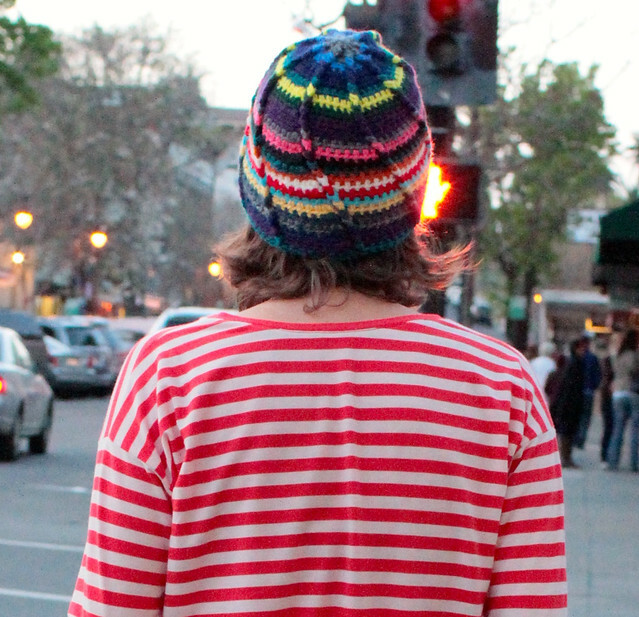 This top is heavily inspired by this lovely striped Scout. I added a curved hem and lengthened the sleeves so they could be rolled up. 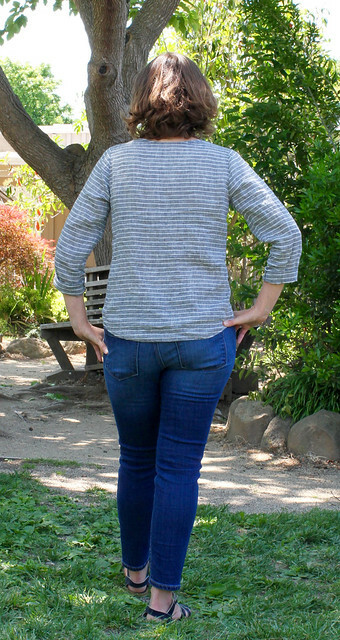 The striped linen fabric from Stonemountain is very lightweight and a little crisp. 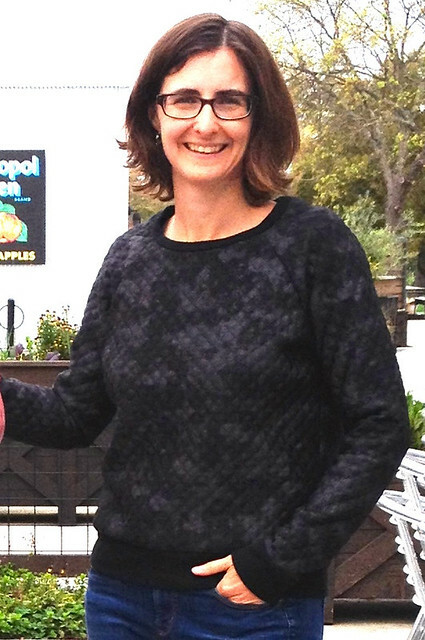 Since it was a little chilly out I layered on my new Linden sweatshirt. Although I wasn’t sure about a plain white sweatshirt I resisted the temptation to embellish. And I’ve gotta say I’m glad. Thanks to everyone who recommended leaving it plain! This is made from an organic cotton fleece. The only adjustment I made was to shorten the body by 2″ just like my other Lindens. 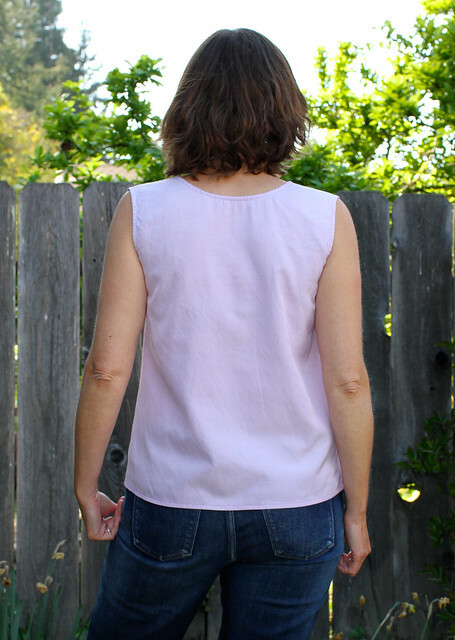 I’m also linking up with Gray All Day’s Sew it Chic in a Week #14. Thanks for coming to visit us in California for Mom’s birthday. It was great to see you! I’m glad you brought your new Mabel skirt. 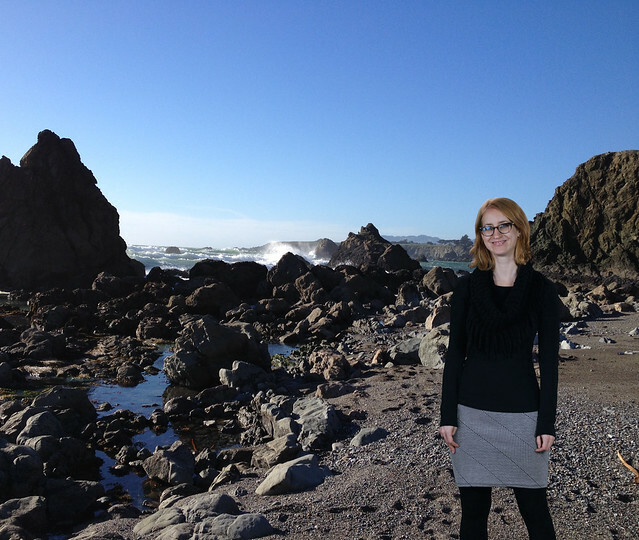 It’s nice to have proof that I sew things for other people… I’ve included a few pictures from our day at the beach. P.S. You thought we were taking pictures in the garage – but really, we were at Wright’s Beach! Magic green screen portal? 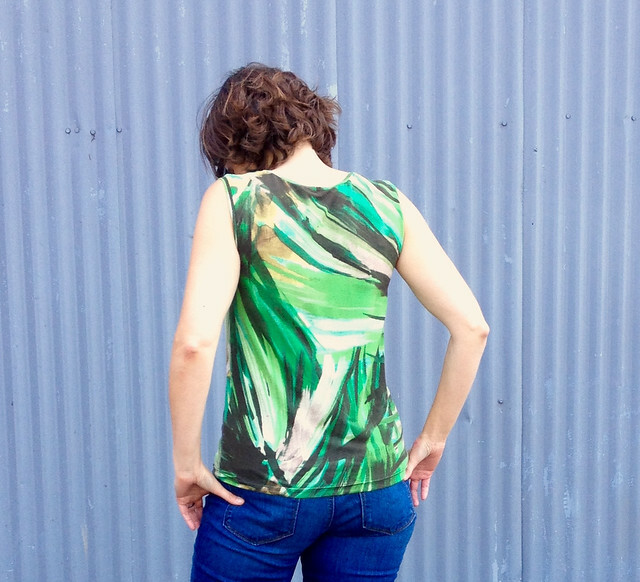 Up next is a striped Gainline Hemlock tee made with my usual modifications. 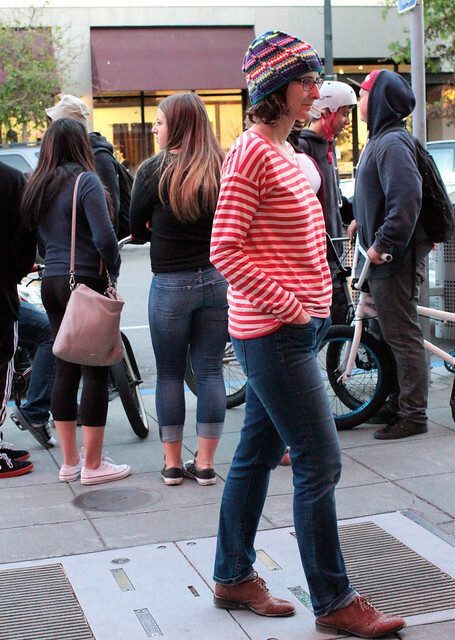 Since it happens to look a little like Waldo we decided to have some fun with the pictures. Can you find me? 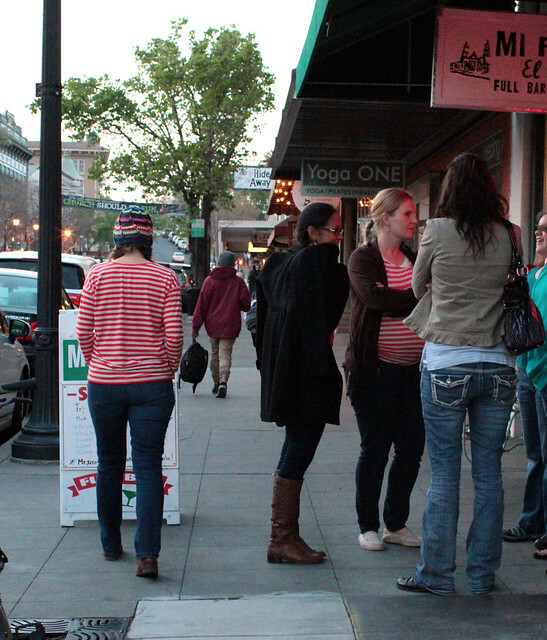 I love that we found another lady in red stripes to include. The hat was crocheted by my sister Abby. She says it’s an ugly hat since it’s made from all her leftover bits of yarn. Since it’s my favorite hat (for now) I call it a pretty ugly hat! 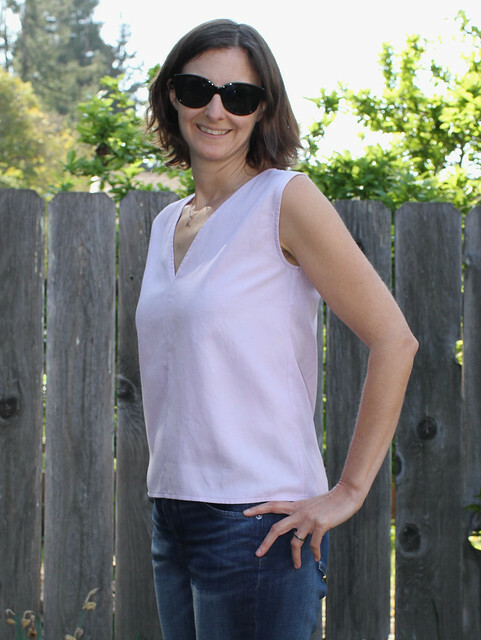 I’m joining Gray All Day’s Sew it Chic link up again this week. Lots of great stuff to see! I’m looking forward to Me Made May – what about you? Last year was my first time and I managed to wear me-made clothes almost every day. I didn’t have anything appropriate for professional public appearances OR muddy days kayaking on the river, but I’ve filled in those gaps. This year I’m going to try the same pledge again. Hello, what have you been sewing? I’ve been working on some silk tanks. I saw this look from the Bally 2015 Spring collection and was really taken with the v-neck tank. 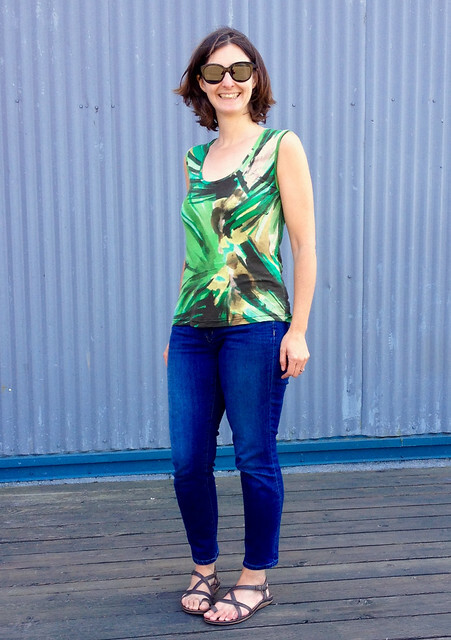 The front seam, deep v, wide shoulder – yep, all of it. 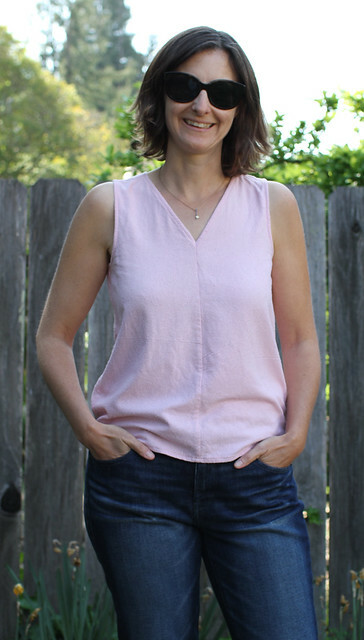 I decided to work from my Scout Tank which is loosely based on Grainline’s Scout Tee. It’s made from a remnant of pale pink silk noil. Love the combination of drape and texture in this fabric. Woohoo! 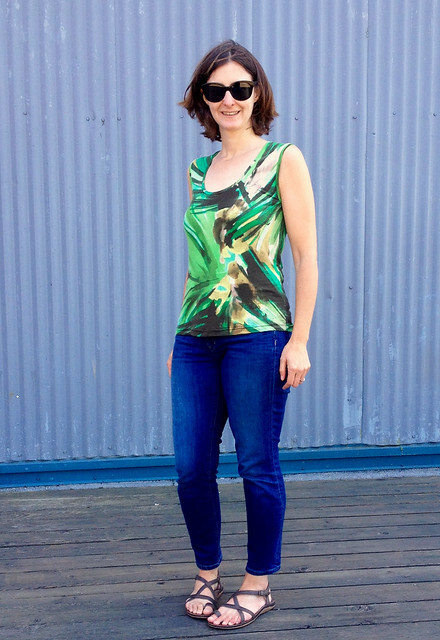 Very happy with this one – it’s got the design features I liked in the Bally tank and is perfectly wearable in real life (ahem, the v-neck is safe to wear to work). The armscye fits better too. This one is made from a lavender silk-cotton twill. I am so digging lavender right now and having a hard time finding fabric this color. I’d like to make one more of these. 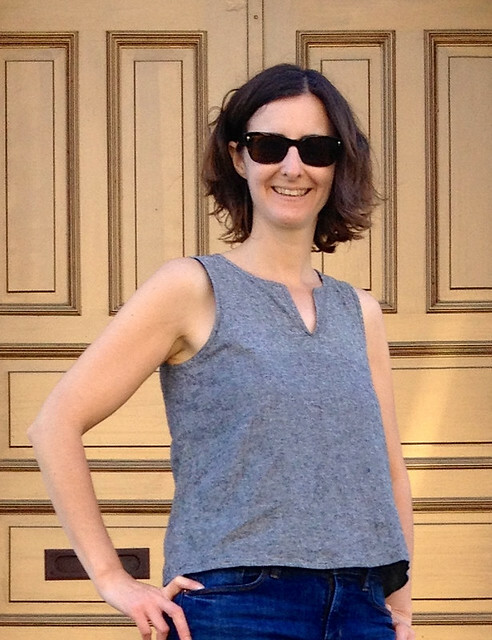 I think a fabric with a little more body might be nice – any suggestions? 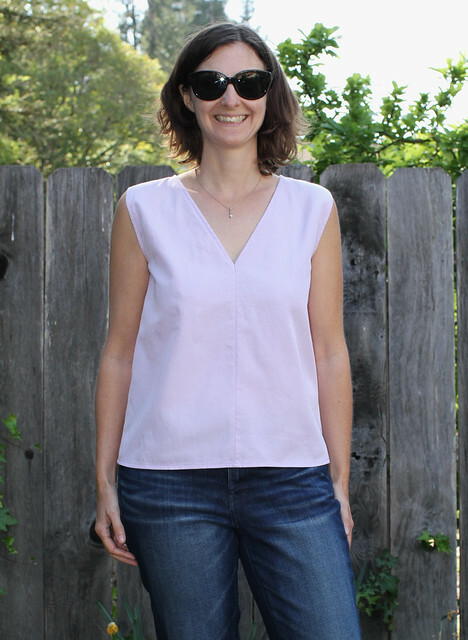 I’m also joining Gray All Day’s Sew it Chic link up this week. Be sure to check it out! Hello there, let me introduce you to Marthe. She’s the newest top in my growing collection of boxy gathered peplums. I’ve had this pattern by Republique du Chiffon in mind for ages. I was a bit worried about the fact that it’s written in French. It didn’t look too complicated so I decided to give it a try. Especially after seeing this lovely version by Stitch and Cappuccino. Figuring out the directions turned out to be easy. But this was my first time using a pattern that needed seam allowances added… You probably know what I’m going to say next. I had the bodice and sleeves all cut out before I remembered that I didn’t add the seam allowances! Argh. Once I recovered from that mistake I sewed the size 36 with just a few alterations. I was concerned that the top might be too long so I intentionally left off seam allowances where the bodice joins the peplum and the hem. To shorten it just a little more the bottom is a double turned 5/8″ hem. I also left of the seam allowance around the neck. I like the fit and am happy with where the peplum hits. 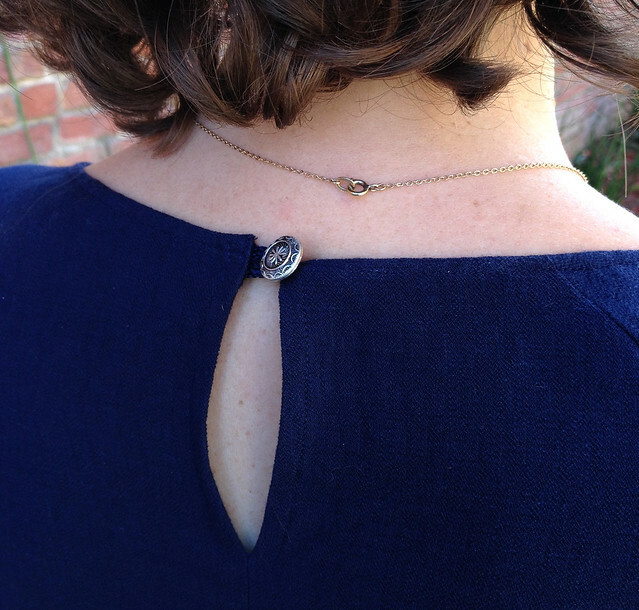 I also included the slit in the back so I could use a vintage button inherited from my grandmother’s stash. The fabric is a poly-rayon blend. It’s heavier than the rayons I’m used to working with and has a bit of texture. I used a cotton-silk blend fabric to make the bias tape for binding the neckline as I find it easier to be neat when I use a more stable fabric for bias tape. It’s rare that I don’t make multiples when I like a pattern this much. But the time for long sleeves will be ending soon. Perhaps a short sleeved one like Kat’s at House of Lane? There’s a black sand washed silk in my stash that might make a lovely version… Or maybe I’ll save the silk for RDC’s Lucie now that I’m not scared of French patterns. 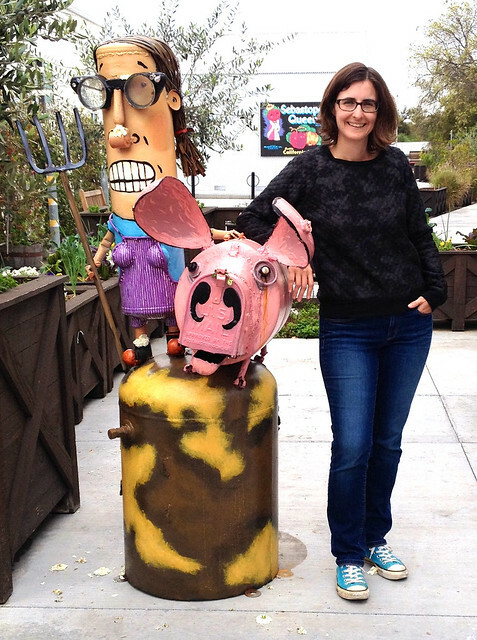 This was taken with a sculpture by Patrick Amiot – a local artist in Sebastopol. I couldn’t resist the farm girl and her pig. I’m sure she sews. The fabric for this one is a quilted black poly with splotches of metallic silver. I overexposed this photo so it’s easier to see what the fabric looks like. I’m not a huge fan of poly (major understatement) but this one just looked so cool I had to have it. No regrets. Although I’ve sewn plenty of cooler weather things it’s been hard to get inspired for pictures. 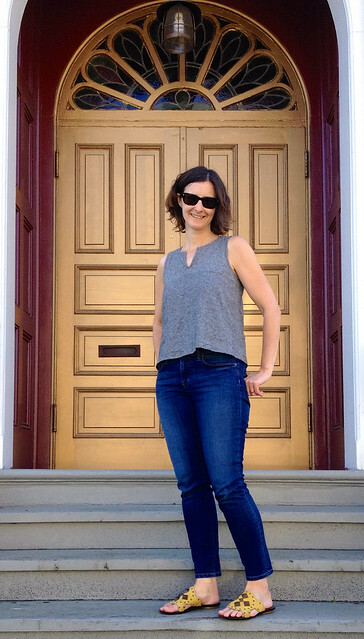 But now that it feels like spring I’m ready to find a cool doorway… This is a swing tank based on Grainline’s Scout Tee first seen in a wild floral last fall. 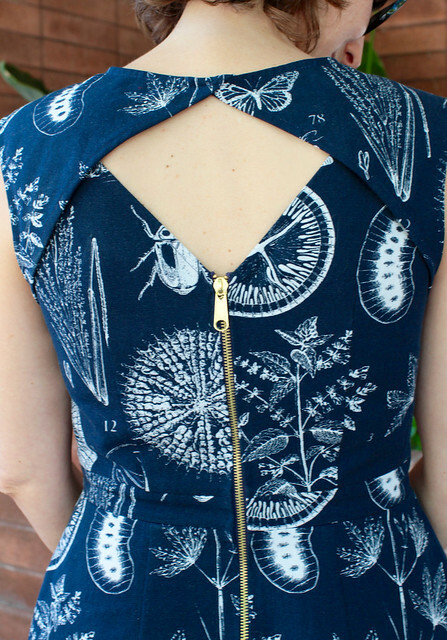 Have you ever bought a piece of fabric and then discovered a big flaw that you couldn’t cut around? That’s what happened with this black linen. There’s a pretty noticeable line where the fabric changes from light grey to dark grey. I debated buying more fabric or covering the line with trim. In the end I figured why not make it a design feature! I was able to line it up on the front just over the bust like a yoke. And I think it manages to look pretty intentional. What do you think? The only change I made for this version was to reduce the amount of swing a little. I just overlapped some of the “slashed & spread” sections to make it a bit more fitted through the body – I probably took out about an inch from the front and back. Next time I may lengthen it a bit in the front.